I decided it was time to share my first ever non-dessert post (maybe the first of many) on The Sweet Obsessions! Pizza is an obsession too, so why not! And it’s also proof that I do cook..LOL! 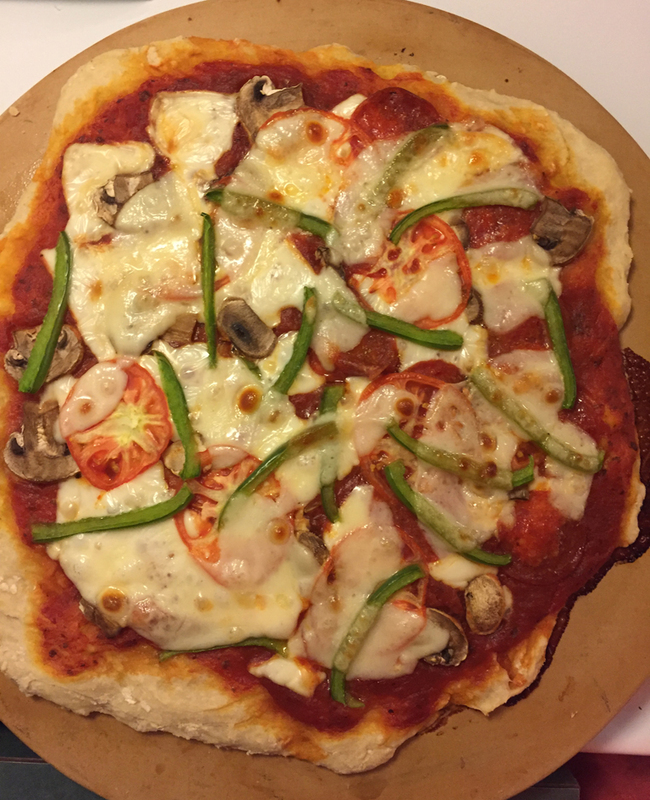 Unfortunately, I only have this photo of my first homemade pizza I made in forever. I had it planned when I got word that there was a possibility that my niece was coming to town, so I thought about making a real simple dinner. She couldn’t make it, but since the husband has Fridays off now (lucky him!) and the weather was turning sour I decided to make the pizza then. I used two types of cheese, mozzarella and provolone, along with a jar of tomato, basil and garlic sauce, sliced green peppers, tomatoes, mushrooms, and some pepperoni. The dough is a simple pizza dough that my mother used all the time. While spreading the dough out on the pizza stone I come to the conclusion that there was no need for this pizza to be perfectly round. Mom used to complain while making a perfectly round pizza when the dough would get too thin from spreading and then holes appear. I didn’t bother making this pizza perfectly round, and there is only the three of us anyway. I threw on the toppings, placed it in a 375-degree oven for 25 minutes and viola! After buying a lot of store-bought pizza or at the local pizza joints, fresh homemade pizza is definitely best, hands down! Top it how you want, as much as you want! I think I’ll make this again for game day this coming weekend! • Preheat oven to 375-degrees. Spray round pizza pan or pizza stone with cooking spray. • In a large bowl, combine all the dry ingredients until well mixed. • Spread the dough out with your fingers to your desired thickness. • Add your toppings. Begin with your favorite tomato sauce. Be sure to not spread sauce all the way to the edge. If using more than 1 type of cheese, top with first cheese, then add toppings, and then place your second cheese over top of the toppings. • Bake 22-25 minutes until crust begins to become golden. *Note: If you don’t want to get your hands dirty, just use your stand mixer with the dough hook attachment!